Did you start dreading the day in front of you as soon as you woke up? Did you feel bummed out when your feet hit the floor knowing that work would soon be your reality? Did you wish your shower could have been a long soak in a jacuzzi tub rather than a blast of reality hitting you in the face? Who hasn’t experienced that at some time in their lives? Would you like to break away from that grind long enough to refresh yourself, get a second wind, spend some time stretched out and relaxing rather than feeling like a ball of stress wound tight? We know you’re grateful for what you have but we also know that being grateful doesn’t make the grind any easier. Don’t feel guilty for needing a break. Everyone does. It’s essential to your health and well being. Ask a doctor! T ake some time for you and get yourself right. Get excited about the adventures that await you and use that energy to carry you until you can get here! A stay at the Palms will do you and your soul some good. Located in the heart of Destin, everything you could possibly hope to do is only moments away from you. From water sports, fresh seafood dinners, nature trails and more, it’s all here to make sure you are ready to go the next few rounds when you get home. Need more “vacation justification”? Call us today at 877-447-3767. Without a doubt the beaches in Destin are the best you can find without a passport! A fantastic thing about them is not only do they provide a natural stress reliever with their beauty but they also reward us with some of the most amazing food. Known for some of the most bountiful waters of any where on the planet, Destin Florida has been called the Luckiest Fishing Village in the World because of the quality and quantity of the types of sea life that can be found just off our pristine shoreline in the sparkling waters of the Gulf. This means our little coastal paradise, renowned for our wide range of freshly caught, delicious seafood, including fish, crabs, and shrimp to name a few, provides the perfect opportunity for your family to savor authentic gulf cuisine at many unique, world class eateries close by to the Palms of Destin Resort. Another awesome way to savor the local flavors is to head down to Destin Harborwalk, where you will find the largest fleet of privately owned fishing charter vessels of anywhere else in the nation. Yes, we take fishing very seriously around these parts. At the wharf you can pick up the freshest seafood ingredients, right off the boat from which they were caught, to bring back to your suite’s fully equipped kitchen! One of our very favorite ways to serve our gulf delicacies, is not only full of bright flavors and fresh ingredients, quintessentially Florida, but it’s also great to serve on one of our hot afternoons as you watch the sun set over our pristine beaches from your private balcony. We hope you enjoy this easy to make and easy to love recipe! Place chopped onion in a colander, and rinse with cold water. Drain.Bring 6 cups water and 1/4 cup juice to a boil in a Dutch oven. Add shrimp; cook 3 minutes or until done. Drain and rinse with cold water; peel shrimp. Combine shrimp and 1/2 cup juice in a large bowl; cover and chill 1 hour. Stir in onion, cucumber, and remaining ingredients. Serve immediately or chilled with crispy, salted tortilla chips and guacamole along with a cold beverage like a Lager or Riesling. 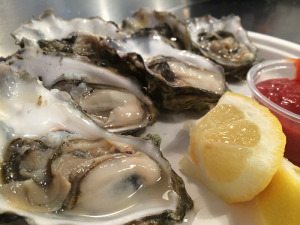 For more beach and Florida inspired recipes, be sure to book your next reservation at the Palms of Destin, the premier beachside resort on the Emerald Coast. Offering 1-3 bedroom suites, each including 2 full bathrooms, our rentals are designed to be your tropical oasis featuring fine furnishings, comfortable beds dressed in fresh linens, spacious bathrooms, and private balconies overlooking sweeping views of our coastal landscape and the charming village of Destin. High speed internet, large flat screen televisions with movies, fully equipped kitchens, and washer/dryer complete your rooms amenities. Our state of the art fitness center is ideal for shedding your cares as well as some weight and our guests will revel in the refreshing sensation of taking a dip in our zero entry or enormous heated pools, surrounded by lush palms and fragrant blooms. Of course, miles of white sand beaches and all the area attractions the Emerald Coast offers, like sport fishing, golf, shopping and more, is just moments away. Make your next reservation at The Palms of Destin today and experience the good times for yourself! Call 1-877-447-3767. Hurry, Labor Day weekend is right around the corner. At the Palms in Destin, we know how important it is to feel appreciated and delighted when you’re spending your hard earned money and valuable time on a trip to one of the most beautiful destinations on earth. This is why why we work so hard to excel at making your stay along the Emerald Coast one you will talk about for years! 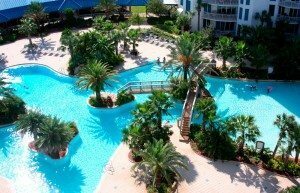 Our resort, set amidst sugar white sands and crystal clear azure waters, surrounded by lush tropical foliage and exotic blooms, sits right in the heart of sunny Destin, Florida. Our tastefully detailed and luxuriously appointed suites, complete with fine furnishings, sumptuous beds and oversized bathrooms, host views of the Gulf of Mexico that will take your breath away and create lasting memories. Relaxing on one of our oversized, pillow top mattresses, dressed with fine linens, while drifting to sleep listening to the gentle rhythm of the waves as they mingle with the orchestra of crickets, night birds and frogs native to our area, will leave your body and mind refreshed. No need for blaring alarm clock, as the calls of sea birds and warm gulf breezes or perhaps the soft knock of one of our highly trained staff delivering a tasty breakfast, will gently rouse you to begin the days activities. Should you decide to make it a beach day, allow our concierge services to worry about the details.We will set it up for you from lounge chairs, to fresh towels to coconut scented sunscreen or even a packed picnic basket, wafting with such delectable aromas that you’re sure to be the object of many a hungry beachgoer’s envious gaze. 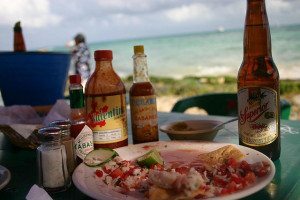 In the evening, enjoy a meal of fresh gulf seafood at one of the many fine restaurants that are located nearby to the resort. For a finish to a wonderful day, slip into one of our heated pools or hot tubs and let the warm water remove any trace of stress from your body and mind. Wrap yourself in one of our soft cotton robes or curl up on our down comforter and let the night breezes caress your sun kissed skin before falling asleep. Indulge your senses and get away from everything with a stay at the Palms in Destin, Florida. We have everything you need and do everything we can, to make your trip unforgettable. The only thing that’s missing is you! Call today to get started on the trip of a lifetime! 1-877-447-3767. The awesome beauty of the Emerald Coast combined with the cooler weather of the unhurried, tranquil fall months is a spectacular sight to behold. Along with mild temperatures, low humidity, and uncrowded beaches, many of our famous attractions, like fishing out in the pristine Gulf waters or from a kayak in the middle of Choctaw bay, actually reach their pinnacles for the year. Our waterways and inlets come alive with a plethora of game fish for every angler in your family. The most popular fishing in Destin is bottom fishing. When bottom fishing in Destin, the captain takes you to places where there is structure on the bottom, where the many varieties of fish live in. The captain holds position above the structure and the fishermen drop their lines to the bottom. Your captain may stop at several bottom spots during your trip. The most common fish caught while bottom fishing in Destin include a variety of snappers, trigger, grouper, amberjack, etc. All yummy, and perfect for coming up in your suite’s fully equipped kitchen. If you love lite tackle fishing, your family may want to go bay fishing for Redfish, Trout, Flounder, Sheepshead, and many others. Generally fishing in Destin’s bay or flats offers calm fishing conditions, ideal for the younger and older members of your crew, as on most days the seas never get over a foot high in the bay. If you have an “Adrenaline Junkie” in the bunch, they might enjoy Shark Fishing at night. Destin Florida is famous for our big Bull Sharks, and there are several ways to catch one of these apex predators, with the most common way involving anchoring the boat where the sharks hang out and chumming the water with bloody fish carcasses. Common types of sharks in our area include Bull, Blacktip, Sandbar, and Mako. Shark Fishing is a bait and wait game, not for the impatient type. You can use resume editing service or go for long periods without a bite or even come home empty handed, but with that said, when a little luck is on your side, you can experience the adrenaline rush of a life time! Another great Destin, Florida fishing adventure is sight fishing, which is a lot like hunting with the most popular Sight Fishing in the Destin, Florida area being for Cobia, a delicious eating fish. The captain will drive up and down the shore line in areas he feels the fish will be migrating, like the other common types of Sight Fish including Redfish, Sharks, and Triple Tail, as well as Wahoo, Hog Snappers, and rays. Last but certainly not least we have Trolling. Destin Florida has some of the most awesome trolling in the world. Trolling is a method of fishing where lines, baited with lures or bait fish, are drawn through the water in order to entice fish to bite. Types of fish often caught include Mahi Mahi, Spanish & King Mackerel and Wahoo. On long trips, Swordfish, Marlins, and Tunas can be caught. No matter what type of fishing you choose, you’ll be happy to head back to the beautiful resort just steps from the beach, the Palms of Destin, which specializes in affordable beach luxury, to cleanup, relax and unwind. Offering 1-3 bedroom suites, each including 2 full bathrooms, our rentals are designed to be your tropical oasis featuring fine furnishings, comfortable beds dressed in fresh linens, spacious bathrooms, and private balconies overlooking sweeping views of our coastal landscape and the charming village of Destin. High speed internet, large flat screen televisions with movies, fully equipped kitchens, and washer/dryer complete your room’s amenities. Our state of the art fitness center is ideal for shedding your cares as well as some weight and our guests will revel in the refreshing sensation of taking a dip in our zero entry or enormous heated pools, surrounded by lush palms and fragrant blooms. Of course, miles of white sand beaches and all the area attractions the Emerald Coast offers, like sport fishing, golf, shopping and more, is just moments away. Or stay in the resort and enjoy a gourmet meal prepared by the chefs at our onsite restaurant! Summer is officially here in a couple of weeks! 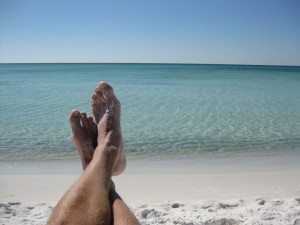 But time flies and all good things will eventually come to an end so make plans now to enjoy some time on the fine quartz sands of Destin before it’s too late. 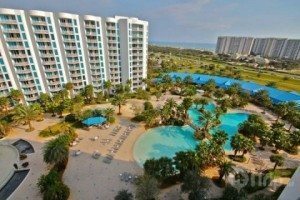 Offering 1-3 bedroom suites, each including 2 full bathrooms, the Palms of Destin, redefining affordable luxury, is the perfect place to stage all your family’s awesome Emerald Coast adventures. 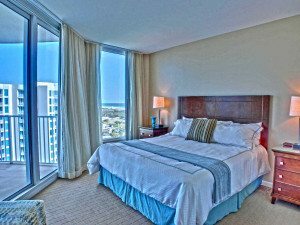 Our units come with fine furnishings, comfortable beds dressed in fresh linens, spacious bathrooms, and private balconies overlooking sweeping views of our coastal landscape and the charming village of Destin, where all the family activities, concerts and fireworks are scheduled to take place. 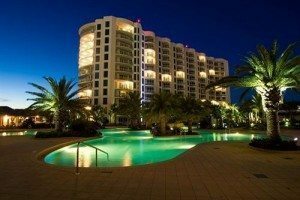 High speed internet, large flat screen televisions with movies, fully equipped kitchens, and washer/dryer round out the comforts and conveniences the Palms of Destin has carefully thought to include in your vacation haven. Of course the beaches and area attractions are just moments away, but you’ll enjoy working up an appetite in our state of the art fitness center or taking a dip in our zero entry or enormous heated pools, surrounded by lush palms and fragrant blooms which give the resort it’s name. Head down to savor a high quality southern experience at our in-resort restaurant, or take advantage of the resort’s central location and shuttle service to hit up any number of fine eateries or on the water entertainment venues close by. It’s time to kick the summer off while experiencing the breathtaking natural beauty of our pure white, quartz crystal beaches and sparkling emerald surf. Make your next reservation at The Palms of Destin today! Call 877-447-3767. Hurry, the 4th of July is right around the corner and you don’t want to miss the fireworks here!